As if I needed another project-let alone a project that intimidates me like quilting....I bought this pattern the other day while I was with my mom that convinced me that I could do this (and that she would help me)!! 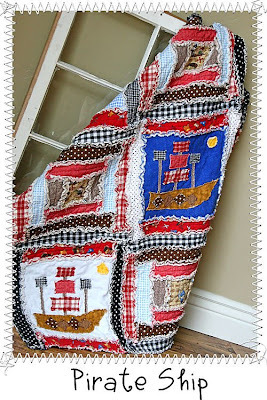 I am going to make it for Mack's bed for his "new" room (if I ever get around to finishing it)!! Isn't it soooo cute? Today while I was scouring over the pattern at McDonald's waiting for Mack to finish his lunch, the girl that designed it came up to me and told me that this was her design. If you would like to peek at some more of her designs, check out her blog at www.sweetandshabbydesigns.typepad.com I fell in love with everything of hers!! !